The Place It sounds contradicting but Thai Tantric is one popular hidden gem in Orchard Road, other than Kra Pow at Far East Plaza. Located in the sleazy Orchard Towers, the casual and no-frills Thai restaurants serves authentic Thai dishes at very reasonable prices without compromising on quality. The space is not extremely big, with tables set aside along the corridor of the restaurant as well. For my dining size of 8 persons, we reserved well ahead and true enough, the restaurant was packed during my visit on a weekend for dinner. The Food The must try dishes for us are Thai chicken wings, glass noodle and tom yum soup. The menu is very extensive too, with more than 40 dishes, reasonably priced in the range of S$8-S$14 for most of the dishes. 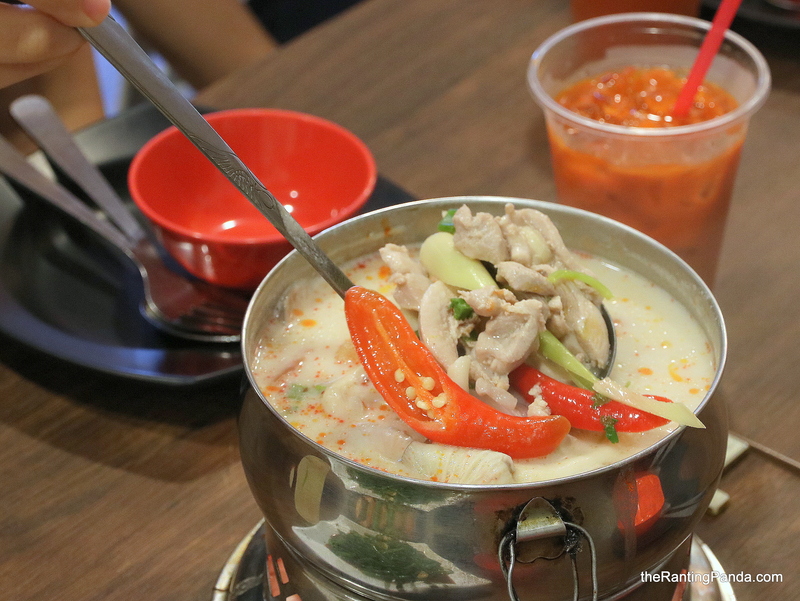 We started with the Tom Kha Gai (S$12), a generous portion of chicken in coconut milk good for sharing even for 3-4 persons. It is not too spicy, but good enough to drink it on its own even without having with rice. The Deep-fried small chicken wing (S$12) is wicked and addictive. I love the crispy skin and the fact that it the wings are long and easy to eat. No Thai meal is complete without ordering the Phad Thai (S$7) for me. This version has quite a moist texture, while the flavours are good. It is not the best Phad Thai I had though. If you are up for some spicy kick, the Stir-fried glass noodle with chicken (S$8) looks deceptively simple but is very spicy. The glass noodle soaks up all the broth which lends it a nice moist texture, along with the seafood ingredients. I will still recommend this dish despite my need for a drink with every mouth. The last dish I had was the Pineapple Fried Rice (S$8), a decent rendition of a classic Thai dish. The portion is quite generous for the price, though the taste is quite average and is not the most memorable version for me. Rants The space at Thai Tantric is not that ideal to linger for long after a meal, unlike other Thai restaurants. It may be a little challenging to locate it for first timers due to the design of the building and be prepared to navigate through some sleazy establishments. Will I Return Again? Prices are really affordable for Thai food at Thai Tantric, though there is definitely much better economies of scale for a group of more than 6 due to the wide variety of dishes to try. It is a worthy option for dining in Orchard Road if you are more budget conscious, although I wouldn’t list it as my top favourite Thai restaurants to go to in Singapore. At a similar price range, my preference is still Noodle Thai Thai Kitchen at Beach Road.